I’ve been taking a trip down memory lane and recalling the very start of my musical journey. 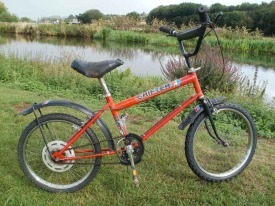 In the late 1970s my Dad got me a Raleigh Grifter bike for my birthday, to be honest he was left with little choice. I had wanted one since they were launched, I remember as a kid watching the TV commercials and loving how they looked like a motorbike. So one day on the way home from school I went into the local bike store and put down £5 deposit on one. Then I went home and told my Dad he had to get it, he was unimpressed, however he did buy me the bike for my 11th Birthday. About a year later at school a friend offered to swap my bike for an electric guitar. K-32 Strat copy, guitars don’t come much worse than this oneIt’s the one shown here, a Kay K-32 Strat copy. I think I was robbed to be honest as it was pretty crappy, but at the time I thought it was as good as the real thing. I took it home and plugged the curly lead it came with into my sisters stereo - she was unimpressed, but I didn’t care, I was Jimi Hendrix. The rest as they say is history - were it not for the bike/guitar transaction then who knows where I would be now? Perhaps fitter.